Yet somehow, all the terrasses around the city are always packed with French people sipping wine and eating €28 meals. I think it has something to do with tickets restaurant, which are tax-deductible restaurant coupons that employers give their employees. If your office doesn’t have a cafeteria, you’re given one per day to (supposedly) use for lunch. Your company pays half, and the other half comes out of your pay. As a foreigner not blessed with such an extravagant perk, you’ll have to search carefully for the deals in Paris. They do exist, and in 3 months staying there I found quite a few. Here they are. 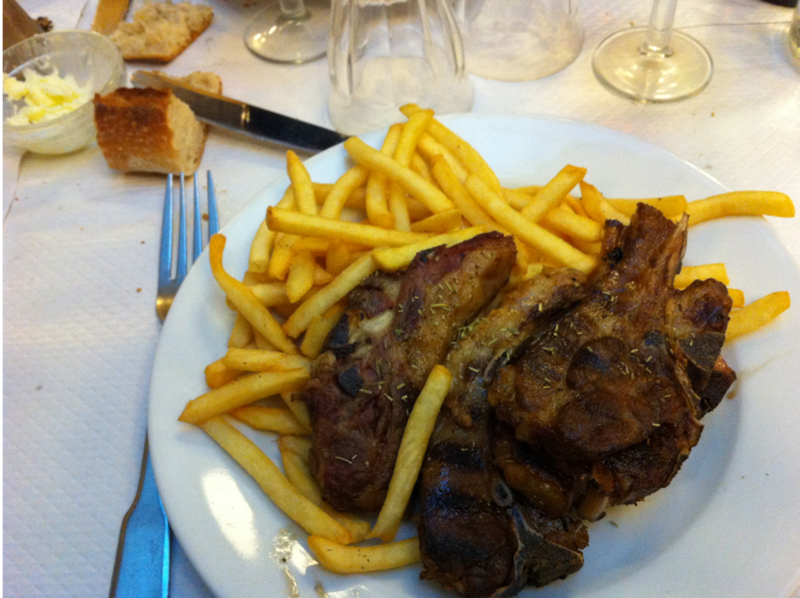 Cafe L’Empire was our “cantine” in Paris, which means the neighborhood restaurant we went to all the time. Somehow, steps from the chic shopping district of Saint-Germain and the touristy Musee d’Orsay, this cafe is incredibly cheap. It’s usually not hard to get a table, and the woman behind the bar will greet you warmly. 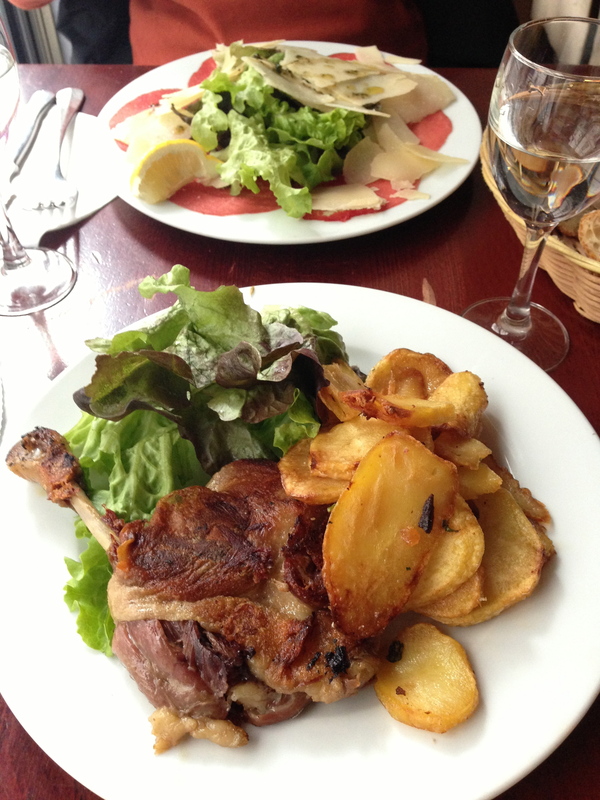 I recommend the duck confit. 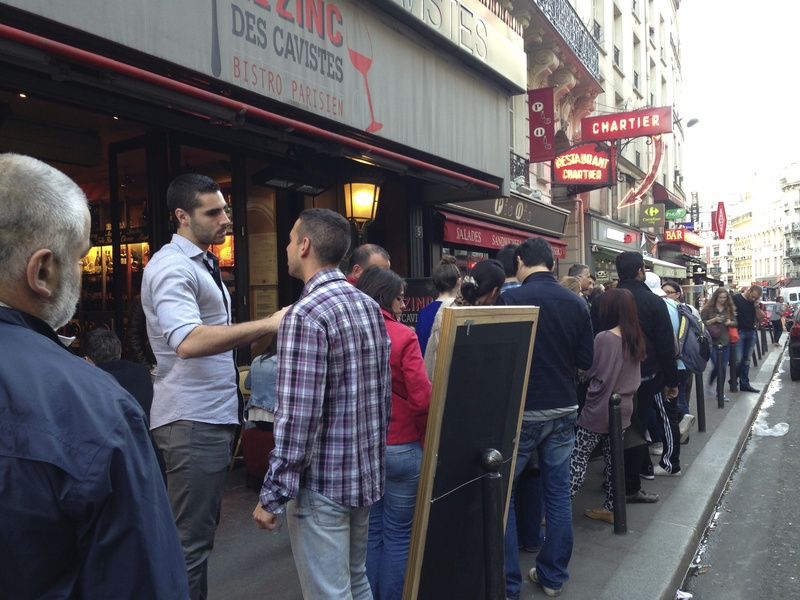 Chartier must be in some guidebook, because the line always extends out the door and down the street. But if you eat at a normal US dinner hour – say, between 6 and 7 pm – you should walk right in. 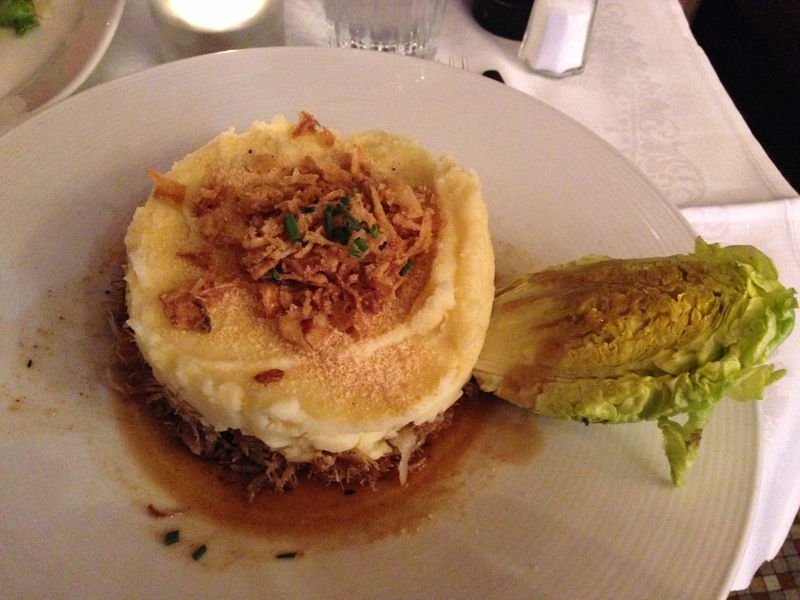 The dishes are basic and French, like leeks with mustard dressing or steak tartare. They keep the prices down by making small groups share tables, so don’t go here for a romantic dinner. Recommended to me by multiple French people, Chez Gladines services cuisine from the Basque Country, an area overlapping Spain and France. 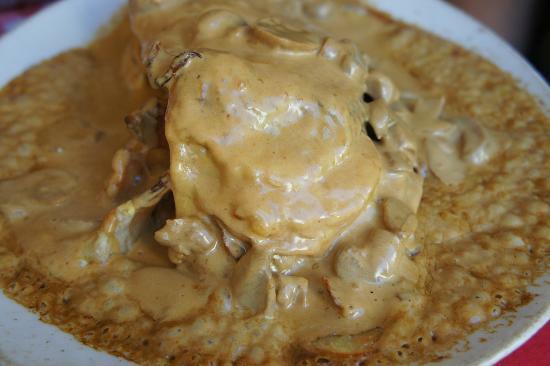 If you’re feeling daring, order the escalope de veau montagnarde – which comes wrapped in bacon, stuffed with sautéed potatoes, and drenched in creamy mushroom sauce. Otherwise, even the salads are gigantesque. This restaurant gets busy so plan to arrive a little early. Cute and modern, La Comète is a good option if the line at Chartier is too long. It’s just a minute or so up the street in the 9th arrondissement. Here, you can get a two-course formule – starter + main course or main course + dessert – for €14.50 (around $18.70, with no tax or tip), which is quite cheap by French standards. 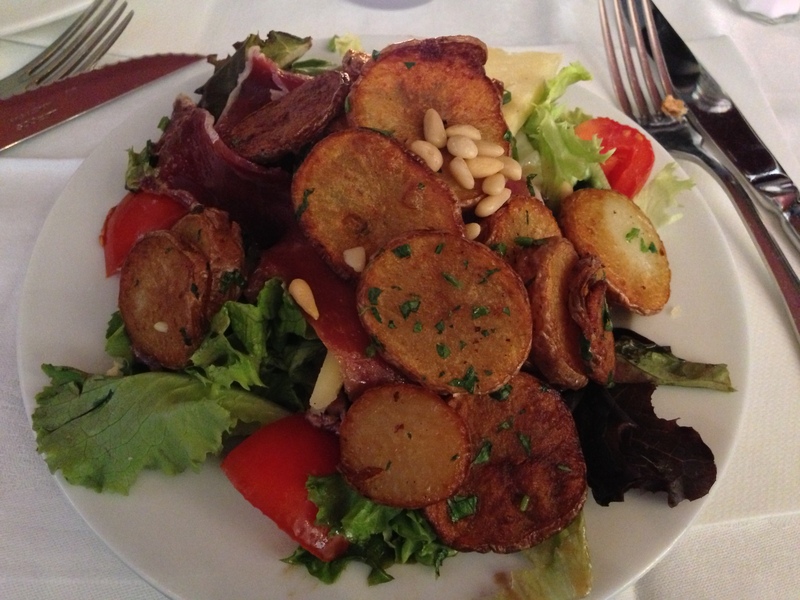 My favorite here is the Petite Auvergnate salad, which comes packed with cheese, pine nuts, a hard-boiled egg, sautéed potatoes, and lardons (essentially, tiny slices of thick bacon). Aarapana competes with the other Latin quarter offerings by giving you a solid Indian buffet, including dishes with chicken, vegetables, palaak paneer, samosas, rice, and dessert. If you can stand the rich red and purple silk everywhere, you can’t go wrong here. At €17.50 ($22.75), this buffet isn’t exactly cheap – it’s the quality that’s standout. You could easily pay more for less (and worse) sushi elsewhere. 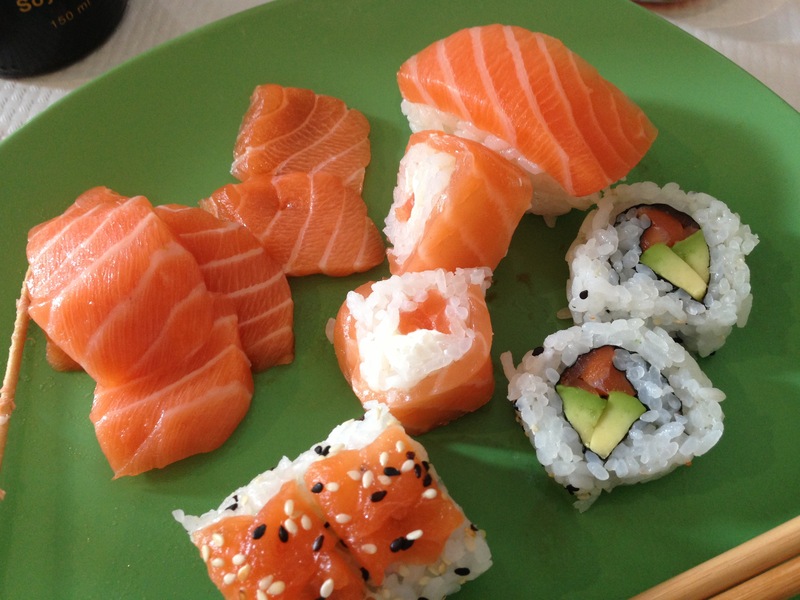 Your options include various salmon rolls, veggie rolls, salad, skewers of meat and vegetables, and desserts. And, unheard of back in the US, this sushi buffet includes unlimited (salmon) sashimi. 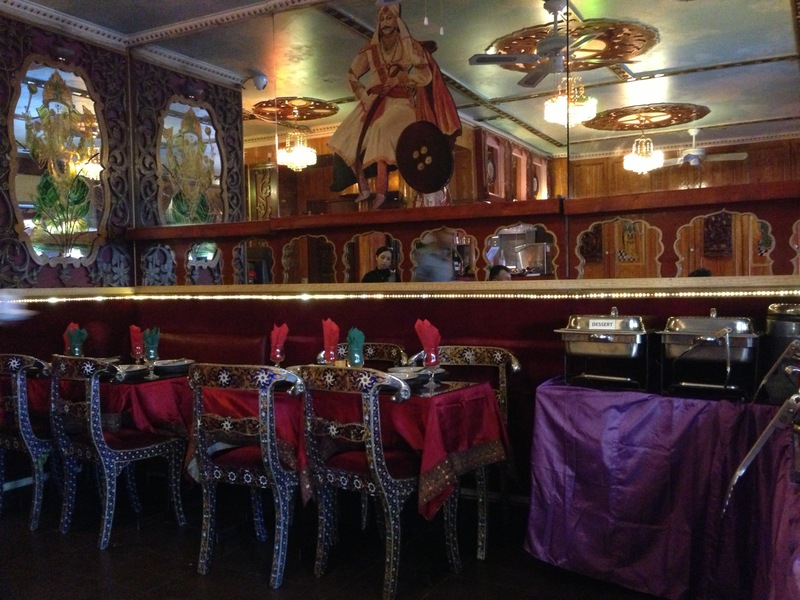 Among the many cheap Indian restaurants in the 10th arrondissement, Sherton was the second we tried and the only one we went to from then on. Many of the dishes, from butter chicken to palaak paneer, cost €6. They’re a bit small, so go with a friend and order three. I’m sad that I discovered Le Cambodge (and its sister, Le Petit Cambodge) so late in my trip, otherwise I might have gone there every weekend. 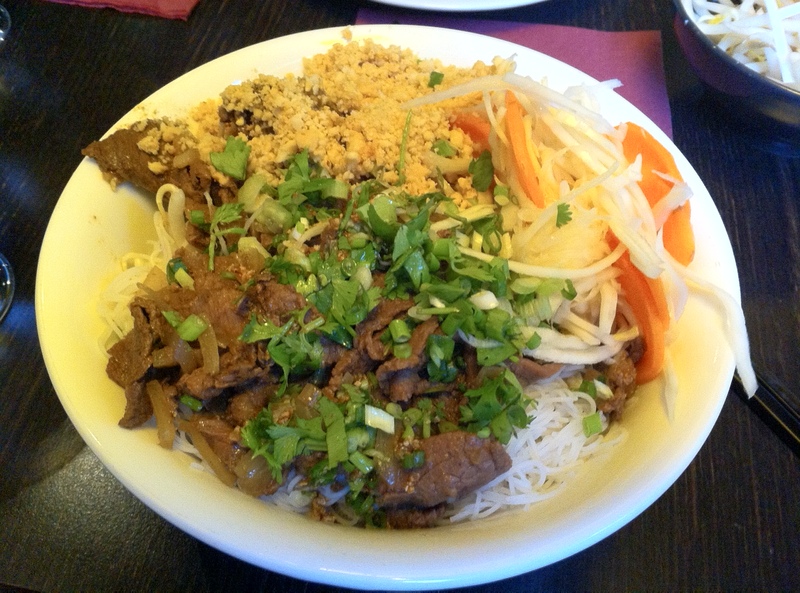 The restaurant serves authentic and less authentic (but no less tasty) Cambodian dishes, their specialty being the bobun – a mix of rice noodles, lettuce, tender beef, crushed peanuts, bean sprouts, and a delicious sauce that costs only €10. They also have curries and soups, but the bobun was so good that I never tried them. Moaz is one of many falafel places in the Latin Quarter, and it’s the only vegetarian restaurant on my list. I’m not big on dishes without meat, but I’ll make an exception for their great salad bar. You can grab a plastic bowl or a pita, then stuff it with as much marinated carrots, olives, cabbage, cucumbers, tomatoes, beets, and tahini as you can. 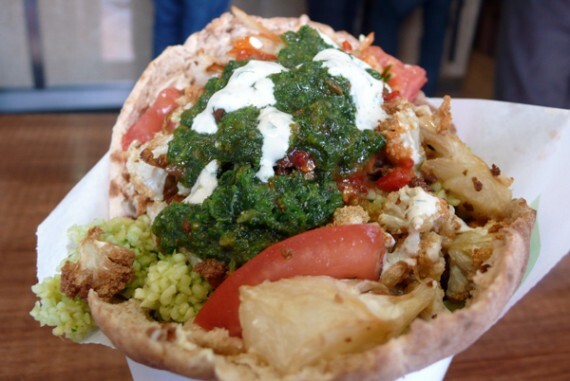 The cashier will pop in three warm balls of falafel, and you’re on your way. 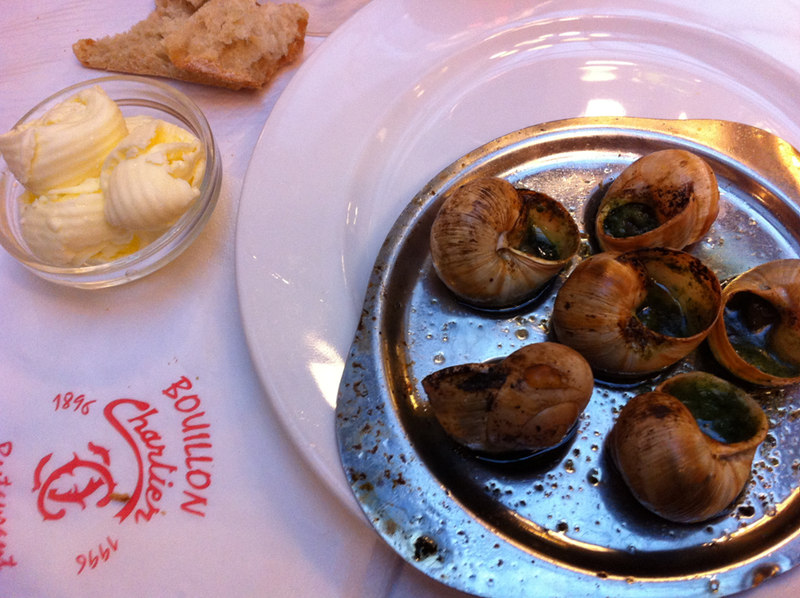 Bonus points if you go eat this by the Seine river or under the shade of Notre Dame Cathedral. There’s one tiny passage in the Latin Quarter that you can’t walk through without getting harrassed by hawkers – begging you to come in and try their couscous, Mexican, and French food. I hate being hustled, but our hunger drove us into one of two side-by-side couscous places, and I think it was the right one. 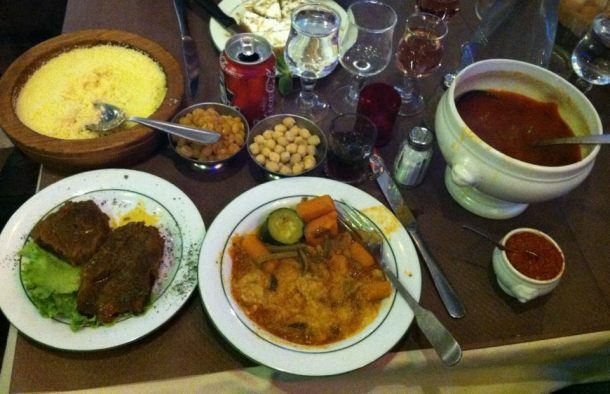 We were served a huge platter of couscous, plates of meat, vegetables, and soup all for under €12. The first time, we got a free glass of kir (white wine plus cassis); the second time, they threw in a sweet mint tea at the end. Merci. Photos courtesy of Barbara, vous en dites plus (Chartier), Trip Advisor (Chez Gladines), Guides-Restaurants.fr (Moaz), and Vegan in Progress (Bon Couscous). All other photos by Kira Newman.